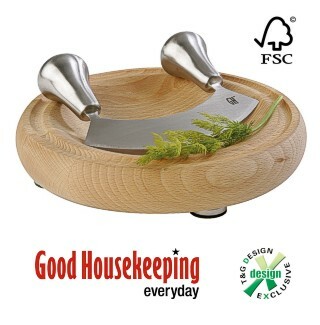 This curved board is made from solid FSC oiled beech and comes with a stainless steel mezzuluna chopping knife and is designed for chopping herbs. Mounted on 4 stainless steel feet it is 21cm diameter by 3 cm (8 1/2 by 1 inch approx). All Good Housekeeping ® wood products are guaranteed for 3 years.